Tracie Louise Gibson, of Chesapeake, VA was born in Oakland, California on June 5, 1962 to Marva L. Clay and Nelson Cage II (deceased). She graduated from McClymonds High School and resided in California until she relocated to Virginia in 1988, where she accepted Christ at Tabernacle of Prayer for All People in Norfolk. She worked for a brief period of time at Conforma Laboratories in Norfolk, and in 1998 she became employed by Tricare Service Center as an appointment clerk. She served in that capacity under multiple contracts through the Hampton Roads Appointing Center/Portsmouth Naval Hospital until her death. Also for the past 20 years, Tracie served the community as a tax preparer with H&R Block and as a result of her honesty and attention to detail, she was able to build a faithful client base. 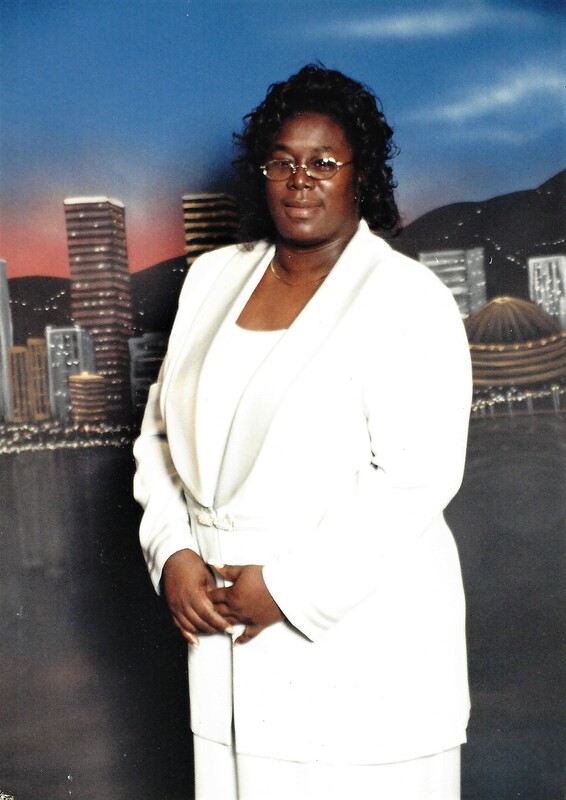 Tracie became a member of Calvary Revival Church in May 2003. She faithfully served in the Bookstore, the Hospitality, and LifeKidz Ministries. In LifeKidz, she taught the 1st and 2nd grade class and was known for her passion and creativity in ministering to the children and was never afraid to step “out of the box” to teach the Word to her students. The LifeKidz children (and staff) especially enjoyed Tracie’s reward system which often included her world famous fried chicken wings. She served on the Food Committee for special events in the ministry, and if ever there was need to collect money for any reason, Tracie became the “Enforcer” and made sure all parties honored their financial commitments. At the time of her illness, she also worked Registration and she was serving as team leader for 1st and 2nd grade volunteers and would regularly call her team members to check on them, encourage and pray with them. Tracie will always be remembered for her friendliness, her loyalty and fierce devotion to family and friends. She had a huge heart and was self-appointed caretaker for everyone that she loved. If it was in her power to provide, she would never let anyone she cared about go without. She had a contagious laugh and loved to hang out with her “crew” and travel or do any fun activity. Her friendships and love for family were lifelong, and she will be greatly missed, but never ever forgotten. Tracie leaves to cherish her memory her mother, Marva L. Clay, sister, Aledgia Childress (Norfolk) and brother Nelson Cage III (Carolyn) of Chesapeake; brother, Tommy Ramsey (California), sister Beverly McIver (Texas), her aunt Patricia Goodman (Texas), nephews, Anthony Cage (Tawanda) of North Carolina, Daniel Cage (Chesapeake); Tommy Ramsey Jr. (California) and nieces Cedrica Wade (Terrell) of Michigan, Ilena Ramsey (California) and Natalia Cage (Chesapeake), a host of cousins, grand nieces and nephews, and a many dear friends and extended family. To my beautiful sister Tracie, you are the greatest light that God chose to bless us with. You brother so much joy to my life, I will always miss you and love you. But I am grateful to know that I’ll see you again. Love you. SORRY FOR YOU LOST MY PRAYERS ARE WITH YOUR FAMILY. I HAVE WORKED WITH TRACY FOR MANY YEARS SHE WAS A GREAT PERSON. Tracie, I think the hardest part of losing you was not saying good-bye, but it’s the way my world will change without you being a part of it. I know that you are in a better place, with no more pain but I which I can explain it to my heart. I grieve but I know the tears are for me. I will missed our times together in service for the church and going out for birthdays, holidays and just girls getting together days. Rest well my friend, for you will be forever in my heart. My sincere condolences goes out to the family-She will be remembered for her kind spirit and humorous personality- May God give you strength in knowing to be absent from the body is to be present with the Lord! Ms. Tracie, although I only worked with you for a short time at HRAC, I truly loved your spirit and sense of humor. I will miss you as my ‘breakfast buddy”. May God comfort your family during this difficult time. Tracie was a remarkable friend. Heaven has recieved a new member. The Brogdon family extends our deepest condolences to Ms. Tracie Gibson’s family together with our heartfelt sorrow and heavy hearts. Tracie was and always will be beloved, will be sorely missed, her caring ways, her cheerful heart, her creativity, her forever friendship, her generosity, her wonderful humor, her love made everyone smile, her sweet sweet spirit, her heart made of pure gold, sharing time with her fabulous family, her friends and helping others unselfishly filled Tracie’s heart with endless joy. May GOD’s Word uplift, ease your sorrow, be a source of unstoppable strength and may the beautiful, blessed, beloved, precious and magnificent memories of Tracie provide comfort and healing forever. Your family is in our thoughts and prayers. GOD is our refuge and strength and an ever-present help in trouble. But those who hope in the LORD will renew their strength. They will soar on wings like eagles; they will run and not grow weary. They will walk and not be faint. Greg and I know GOD cares, HE will carry you, will comfort you and will cover you and your family during this difficult time and beyond. Keep Walking in GOD’s Bountiful Blessings.